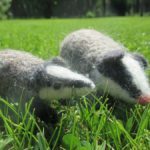 These gorgeous badgers are only a few of the amazing creations Fi Oberon makes from fleece- she is one of Britain’s most renowned needle felters and she is a brilliant teacher..we are lucky enough to have her joining us for our May Fleece to Needle Felt week (May 25th-June 1st), where she will be spending two days, teaching participants how to make stunning sculptures from fleece. The special part about this course is that the first half of the week will be spent, washing, sorting and naturally dyeing the fleece ready to felt with Fi. If you prefer wet felting that is also an option. 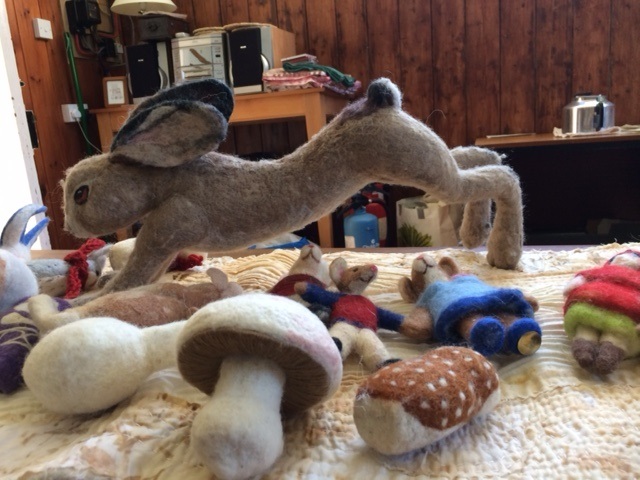 including, hares, life size foxes, mice, and at the moment she is concentrating on Venus Figurines, some of which, she will bring along with her, so you can have a go yourselves. It will be a wonderful immersive week of craft, plus you get totally looked after..picked up in Inverness, cooked for, accommodation organised, driven around..all you have to think about is what you might make at the end of the week! The week also includes..all meals, some evening workshops (including spinning), beautiful accommodation at the Old Stables (a lovingly converted barn which is homely and modern), visits to glen Affric (known as one of Scotland’s most beautiful glens), transfers from Inverness. All you have to do is get to Inverness..which is quite easy even if you are coming from overseas. Inverness has it’s own airport, so you can fly from London or fly into Edinburgh or Glasgow and get the train up. If you want to learn something new in a stunning Highland retreat, come and join us for a wonderful week of craft, in Strathglass, nr Inverness, Scotland.